Throughout the past decade, we’ve witnessed an incredible improvement of people’s understanding of dyslexia. It is one of the most commonly studied learning differences nowadays. What’s changed? Teaching reading through more approachable techniques still is the main focus. However, we’re also getting access to online resources that can improve the reading fluency and comprehension with dyslexic students. These are visual spatial learners. Their primary way of processing information is visual, and that’s exactly what online learning materials are focused on. Does it work? The student has to make some effort to master eLearning techniques. This type of learning can be more engaging than the traditional classroom method, but it has to be done right. 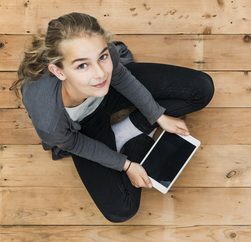 We’ll list 7 ways for dyslexic students to master eLearning techniques. A case study at the University of Zagreb, Croatia, confirmed the importance of adapting e-learning courses for students with dyslexia. What does this adaptation mean? In this case, the researchers designed a course Introduction to Programming in C++, and adapted it for dyslexic students. They included interactive video tutorials, eBooks with narration, mind maps, PowerPoint presentations, images, and self-assessments. This shows that any online course can be adapted for a dyslexic student, regardless of their age and preferences. 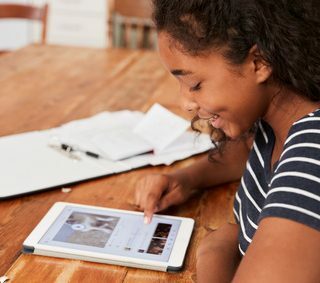 If you cannot find a specific course designed for dyslexic students, you can create additional materials, such as narrated eBooks, mind maps, and PowerPoint presentations to help them learn. Online learning is useful for dyslexic students because it offers them an ability to restrict the volume of text visible on the screen. This makes any material easier to read. Just let the student zoom the page, so the font size will increase. Before the student starts learning, they have to know how to navigate the material. That might be difficult at the beginning, but it becomes a habit as they practice. The student should be able to navigate without any effort within an online course. Explain how they can use navigational aids, such as buttons in different colors, icons, and arrows. When an online course includes text, you can print it out for the dyslexic student. Why is this important? They have control over the font and font size. If they do better with a particular font, that will make the material easier to read. You can also adjust the column width. For some students, this makes a big difference. When any student decides to take an online course, they have to do it with a plan. For a dyslexic student, the goals and objectives make an even greater difference. What do they want to achieve? How can they meet the course requirements within a given period of time? Encourage the student to stick to a clear roadmap. If they learn a little every single day, they will meet the objectives, eventually. One of the most important advantages of online learning is that it’s not associated to a traditional classroom. However, it’s still important for the student to learn in an organized, quiet, and distraction-free space that’s available for them to use at any time. The study environment will affect their focus and will to learn. It will quickly get them into work mode, so they will be able to go through another module without making crazy efforts. Dyslexic students may not be able to look for answers to their questions related to the course. They will need support during the process of learning. As a parent or educator, you have to be there for them. You can also connect with an online tutor, who will provide additional instructions via video conferencing. The most important thing is to keep them motivated. If you notice the student is not meeting the objectives, remind them that online courses are flexible. They can adjust their calendar and continue working towards their goals. Chris Richardson is a journalist and editor. He is fond of traveling, sports, and playing the guitar. Chris finds his inspiration in writing. I enjoyed your post so much, thanks! I’m a teacher in online school and it’s sometimes hard to bring to them all those information about online research so I’ll surely share this information among them! One more important thing to do before submitting your research is to check it in plagiarism checker to be sure it’s unique. As i receive daily so many researches which are 70-80 % and even 100 % plagiarized. And it’s awful! I don’t even read them! So be sure you’ve done it. Loving this post. I wish I had read this before – I had a dyslexic trainee once and seems like he had some difficulty with our online courses. Anyway, hope this can help – goes for anyone too – how to master elearning courses (taking them).